Like most Columbus website design firms, we adhere to the "Gospel of Google." 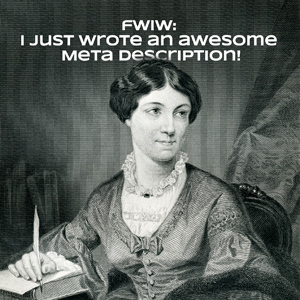 So when they make recommendations about Meta Descriptions and how they help with SEO, we listen. When the Google Webmaster blog describes Meta Descriptions (also called Meta Tags) as the "synopsis of a book on the back cover," you know you should take it seriously. A synopsis, the quick overview of what the book is about on the back cover, is potentially the last thing you read about that book before you decide to buy it. The Meta Description you write for home page of your website is that synopsis. It's the first, and possibly last, thing a prospect will see before deciding if they're going to click the link to your website in Google's search results. So if your Meta Description doesn't appeal to your prospect's sense of how your company will benefit them, you could easily lose that person in those last few seconds. That article was written in June of 2017, so the importance of good Meta Descriptions from Google's perspective is as important as ever. Make sure your Columbus web design firm offers SEO. Like any good Columbus Oh website design firm, we provide SEO services for all the websites we do. Of course, not every web design firm offers that, and if they don't, you might want to reconsider the web design firm you're using. An inexpensive website does you no good if there's no SEO built into it, because it won't show up very well - or at all - on Google's (and other search engines') search results. In mid-2017 we inherited a website done by an inexperienced (thereby inexpensive) web designer. That website had zero SEO built into it. We wrote a blog about it detailing how we re-worked the homepage and added SEO to Mid/West Fresh's website, which you can see here. For those of you how might not be familiar with what Meta Descriptions are, and their importance in search engines, watch the first 40 seconds of this video talking about Page Titles and Meta Descriptions. Below is a screen shot of how a Page Title and Meta Description would show up in Google's search results. That screen shot is taken from a blog post we wrote talking about the website we inherited. Meta Descriptions are a little ad for your website on Google's search results. If your website designer doesn't use Yoast for SEO, you should find a different web designer. Yes, I had toast for breaskfast, thank you. ... then you should look for another web designer. Yoast is the industry standard SEO plug-in/module for all websites, and it makes good SEO a relatively simple task. We use "Yoast," which is a "plug-in" for Wordpress, and "module" for Drupal. It shows a progress "report" or "cheat sheet" as you put in your blog copy, Page Title and Meta Descriptions, as you can see from the screen shot below. This gives you an up-to-the-minute overview of just how well your SEO is going, as you're posting content on a particular page or blog post. How long should the copy on your page, or blog post be? Of course, it depends who you ask. We've seen studies that say 2,500 word articles are shared more than 500 word articles. We don't know very many people who have the time to read a 2,500 word article. And even though we try to write 1,000 word blog posts (as you can see from the 3rd from the bottom green bullet point), Yoast suggests a minimum of 300 words. We've also read that's Google's suggested minimum word count. There seems to be no question that Meta Descriptions are one of Google's ranking signals. Contrary to what we said in the beginning of this post, we've read that Google claims Meta Descriptions aren't one of their ranking signals (of which there are about 200). However, it seems fairly obvious to everyone in the SEO-world, Meta Descriptions influence whether someone clicks the link in Google's search results, to go your website. Also, if Meta Descriptions weren't important, Google would not have posted an article entitled "How to write good Page Titles and Meta Descriptions." There's a reason those in the SEO-wprld believe Google uses Page Titles and Meta Descriptions as a factor in ranking websites. That's because Google needs to return the best results from a search. Because if they don't, you (and lots of other people) would start using bing! And that's crazy talk!